The Zionist so-called "Jewish Agency" has been active for past decades bringing masses of immigrants to their "state of Israel" with the purpose of creating a Zionist majority within the land over the Palestinian population. Leading Orthodox Jewish Rabbis and communities throughout the world have opposed the Zionist philosophy, the existence of the "state of Israel " and the Zionist efforts to promote mass immigration. Since its inception the goal of Zionism has been to transform Judaism from a religion into a nationalism, void of Godliness. The work of the so-called "Jewish Agency" over the years has been to uproot religion from untold thousands of Jewish souls while promoting oppression against the indigenous Palestinian people. 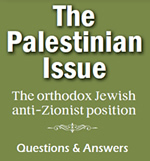 Besides this, the basic concept of Zionism is contrary to Judaism because Jews are in exile by a divine decree and are strictly forbidden to create a their own sovereign state.This would be forbidden even in an uninhabited land but when this was created in an inhabited land by oppressing and killing the indigenous population of Palestine it simply compounded the sin many fold. Recently, an organization called "Nefesh B'Nefesh", a branch the so-called "Jewish Agency", began making inroads into the Orthodox Jewish neighborhoods in the guise of honesty and holiness. 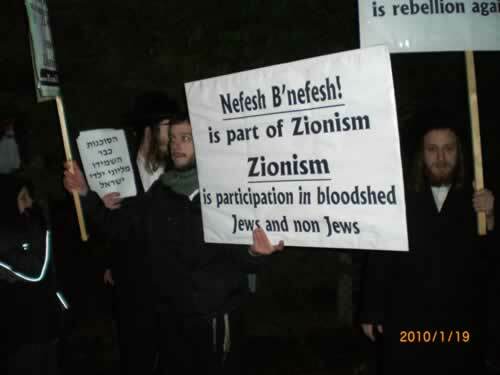 Anti-Zionist Orthodox Jews worldwide are outraged when these activities are taking place within the Orthodox Jewish communities. Many Jewish communities have shown its strong opposition to these activities and managed to prevent these groups from infiltrating their Orthodox Jewish neighborhoods. Last week these activists scheduled an event in London. When the local Rabbis realized the essence of the scheduled event, they demanded of the owners of the venue that it be cancelled. Here in Manchester these agents scheduled another event for tomorrow, Tuesday, January 19, 2010 in one of the local Jewish Synagogues. Once the Rabbi of the Synagogue learned what this was about he demanded the event be cancelled. Despite many threats of financial and legal retaliation the board remained strong in their decision. With no shame the agents decided not to respect the Rabbis decision and to hold their event on the streets outside the Synagogue. Despite past personal attacks against anti-Zionist Rabbis and layman, and in the face of the tremendous threats and intimidation the anti-Zionist Orthodox Jews will nevertheless gather in protest of this shameful event.